Drawing on six years of interviews, fieldwork, and research conducted among members of the Church of Scientology, this groundbreaking work examines features of the new religion's history, theology, and praxis in ways that move discussion beyond apostate–driven and exposé accounts. The Church of Scientology is one of the most recognizable American-born new religions, but perhaps the least understood. With academic and popular interest on the rise, many books have been written about Scientology and surely more will follow. Although academics have begun to pay more attention to Scientology, the subject has received remarkably little qualitative attention. Indeed, no work has systematically addressed such questions as: what do Scientologists themselves have to say about their religion's history, theology, and practices? How does Scientology act as a religion for them? What does "lived religion" look like for a Scientologist? This is not so much a book about the Church of Scientology, its leaders, or its controversies, as it is a compilation of narratives and histories based on the largely unheard or ignored perspectives of Scientologists themselves. 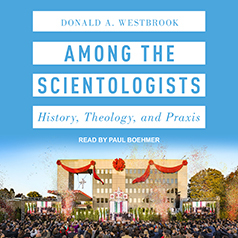 Drawing on six years of interviews, fieldwork, and research conducted among members of the Church of Scientology, this groundbreaking work examines features of the new religion's history, theology, and praxis in ways that move discussion beyond apostate–driven and exposé accounts.